Lotus is a soft plant living mainly in water. This pink or white flower belongs to a species of plant called hollyhock. Another species of lotus with a very small trunk, leaves, and flowers is named little lotus. It can be planted in a vase of water or in an ornamental pond. Lotus flowers have been growing for millions of years. In Viet Nam, the lotus is classified as one the four gentlemanly flowers along with pine, bamboo, and chrysanthemum. The lotus is also classified as one in the four qui (four seasons), which also includes orchid, chrysanthemum, and apricot. Lotus is the symbol of summer because it blossoms in summer when there is a lot of sunlight and its scent lightly perfumes the air all around the pond. Lotus flowers are used in different ways: the flowers are offered to deities, the seeds are used for tea, and the leaves are used to wrap green rice. Lotus seeds can also be made into a tonic medicine and anesthetic and into an ingredient for sweet soup and other recipes. 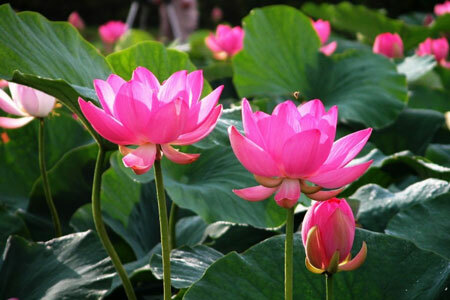 Lotus flowers generally bloom during the summer since they require plenty of light.